Aquaman has proven that there’s still a lot of life in the DC Extended Universe. Barely a week after Aquaman passed the billion dollar mark, Warner Bros. has dropped a new teaser for its next film, Shazam. And unlike the King of Atlantis, Billy Batson is literally a boy in man’s body. The new Shazam teaser features Billy (Asher Angel) enjoying his new ability to become an adult superhero, as played by Zachary Levi. Billy’s fantastic new powers are also a plus, but he seems to be far more excited about enjoying the perks of his older self. Levi also shares an amusing with Jack Dylan Grazer, who plays Billy’s best friend, Freddy. Djimon Hounsou plays the Wizard who gave Billy the powers of Shazam. In the original comics, the Wizard was actually called Shazam and Billy’s alter ego was Captain Marvel. However, DC has shied away from using the Captain Marvel name since the New 52 reboot in 2011. 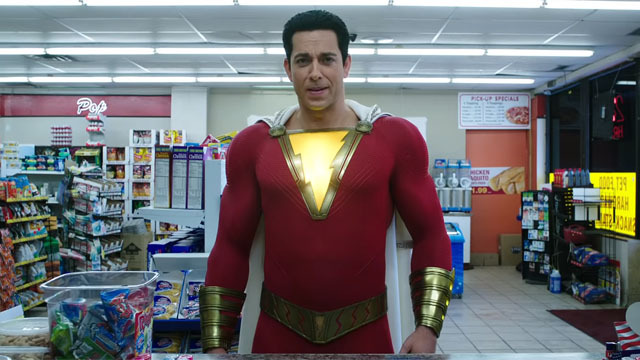 The film is taking some of its cues from that reboot, including its depiction of the Wizard and some aspects of Shazam’s costume. Mark Strong is playing Shazam’s nemesis, Dr. Thaddeus Sivana; while Grace Fulton is playing Billy’s foster sister, Mary. Faithe Herman, Ian Chen, Jovan Armand. Cooper Andrews, and Marta Milans round out the cast. Shazam will be released in theaters on Friday, April 5. What do you think about the new Shazam teaser? Let us know in the comment section below!